With H.265 compression technology and embedded with 4 HDD design providing up to 32TB, the ND9441 and the ND9541 offer greater than 30% more recording capacity than systems employing H.264 compression. This advance gives users larger storage space for longer durations of video recording. In order to provide uninterrupted service even when the network is temporally disrupted, both NVRs are also equipped with dual Ethernet ports, as well as providing the flexibility to connect with network cameras in network failover situations. In addition, the RAID 0/1/5 configuration provides further data security in the rare event of a hard drive failure. Further enabling the recording of high-quality and detailed images, the ND9441 and the ND9541 support a maximum network camera resolution of 12-Megapixels. To intelligently manage bandwidth while maintaining this high-quality, the “Auto Adaptive Stream” function will adjust the display resolution automatically for each different layout type. 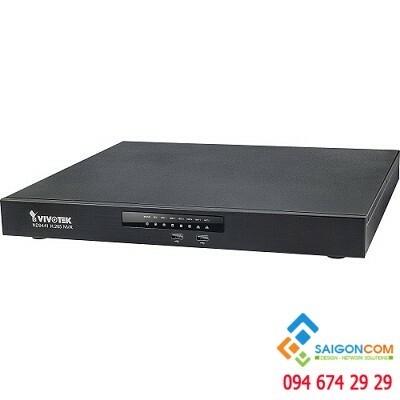 Đại lý phân phối VIVOTEK, hàng luôn có sẵn trong kho cho tất cả các model.